The FLEXiO® 690 stationary system puts the weight on the ground for extended spraying comfort. It can paint a wall 11 times faster than a brush or put a fine finish on furniture, saving time and effort. 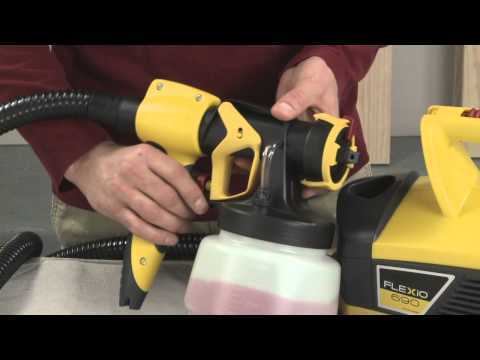 The FLEXiO 690 comes complete with two nozzles, one for big surface projects like walls, ceilings, siding and fences and the other for small projects and fine finishing on cabinets and trim. The turbine sits on the ground delivering air power through the hose to spray unthinned coatings with adjustable control, full coverage and low overspray. Cleaning is faster than a brush or roller with a few removable parts that rinse clean, and the provided bag stores the hose and nozzles. Flexio 690 Sprayer is rated 3.8 out of 5 by 10. Rated 2 out of 5 by Jackson123462135762456 from Only good for one round of paint My stick handle on my roller broke so I decided to go ahead and just buy a sprayer kit. I went with this one because of the easy handling. Well it worked just fine until I had to refill. Once you refill BAM paint everywhere out the side in globs. Turns out the paint dries inside the nozzle so you have to completely take the front end apart between each use. Wagner, seriously is this product worthless or am I missing something... or maybe just not designed for latex paint. Rated 5 out of 5 by KathyJ from Easy to use, easy to clean I used the Flexio 690 to stain a lattice fence and lattice wall under my pool deck. It took me 50 minutes to stain and 15 minutes to clean up and put back together. It gave a nice even finish and I only needed to put on one coat. On the 4X4 posts of the lattice fence, I used a brush to even it out and prevent any running of the stain. Next time I have a staining project, I won't put it off because this product makes it so much quicker and easier. Rated 1 out of 5 by birdnflt60 from Storage Bag NOT Big Enough I will change my review once I have actually tried the product. However, WAGNER YOU NEED TO MAKE THE STORAGE BAG BIGGER! I have tried a few different configurations and while everything will fit, it will not zip closed. Engineers, go back to the drawing board and send me a bag that is functional. Rated 4 out of 5 by whittyrebel from Painted my privacy fence in no time! Yesterday I stained the inside of my privacy fence (6ft x 8ft panels and I have 25 panels to stain, including the posts). it only took me 3 hours to stain 25 panels and that is including a 30 minute lunch break. So actually it only took me 2 and a half hours to paint 25 panels. My only gripe is cleaning the gun and all the small parts that remove from the gun. I'm sure all spray guns are a pain to clean, and I am very thorough on cleaning my tools and ensuring they work for many years to come. Even with staining the fence and then cleaning I only spent about 3.5-4 hours total. I will continue my job on the next nice day I have to see how the flexio 690 will hold up after the cleaning. I will update this post or post another review of the product if I have any troubles, but I don't anticipate having any issues. I would definitely recommend this product to a friend. My only reason for not giving this product an "excellent" review is due to the time spent cleaning and the plastic movable pieces that seem fragile, especially the trigger which needs to be removed to clean the handle well. Rated 5 out of 5 by Dee95 from For a professional look the Wagner Flexio 690 is exactly what you want. The Wager Flexio 690 is a jewel to work with. It is light weight and very balanced with paint in the container which makes it easy to use and handle. It has very little over-spray. My husband and I were painting a bathroom vanity, 4 drawers, 3 doors and the vanity box. I hate paint brush/roller marks so I thought a sprayer would be the way to go. I had purchased another sprayer which was a disaster, dumped paint everywhere and then I had to start from scratch after removing the mess the first sprayer made. Needless to say I was not happy about starting a project over and having to remove paint from my doors and drawers. I decided to try another sprayer and use the Flexio 690, I am so happy I did, as this paint sprayer did a wonderful job. The sprayer comes with a nice storage case and 2 containers. One for detailed work and one for general painting. 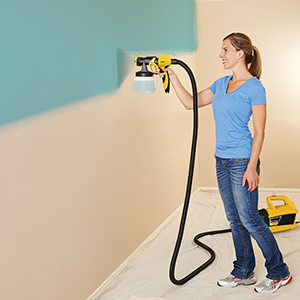 You do not have to thin latex paint to use this sprayer. The sprayer was very easy to use. Set up is stress-free, just pour your paint in the container check your settings and start painting. Practice first on a piece of cardboard or use the paper instructions which are included in the box to get familiar with handling the sprayer. After our practice session we found the Wagner 690 sprayed a nice even pattern which was easily maintained with no drips or runs. We did use a high grade advanced paint which gave our project a profession look. Start your painting project by pulling the trigger half-way this starts the motor, and then pull the trigger all the way to start painting. The direction of the paint can be adjusted to control the amount of material and width. The instructions said you can also paint ceilings, which will be a big plus down the line for us. We hate painting ceilings. If you experience any problems call their customer service line they provide immediate help. Wagner provides very detailed directions on how to clean the sprayer. Their instructions are clear and concise. Cleaning is easy but can be time consuming. I wanted to make sure everything was cleaned well as we had several coats of paint to spray on and the weather was not cooperating with us. Make sure that the suction tube is cleaned out well. The cleaning did go faster after each use. In conclusion, after priming, and painting 3 coats of paint I would highly recommend the Wagner 690 paint sprayer, it provides a high end finish and easy to use. After seeing how great the Flexio 690 preformed, we are contemplating painting our kitchen cabinets which will be a big job, and which I had no intention of starting. But the upgrade will be worth it in the end. We also have 2 rooms to paint and since the over-spray was minimal I will not hesitate to use the paint sprayer in the house. Rated 5 out of 5 by Fred22 from We're moving and I've been painting like crazy Bought the Wagner 690 hoping to easy my pain, because I have to tell you I'd rather pay taxes than paint! Get the picture? I hate painting! I have 12 rooms to paint most of the will require 2 or 3 coats because my wife and I love exotic colors but real estate agents hate them I did the first 2 rooms with a roller, OMG I rather step on a bees nest in bare feet. Bought the Wagner 690 and have painted 4 room with the little gadget and while there are hundreds of things I'd rather be doing besides painting, I can at least say now I'd rather paint than pay taxes or get stung by bees. I've read a million review and I have to say anytime the machine didn't work right WAS MY FAULT. It only happen twice, once I did not tighten the nut on the end of the nozzle and as advertised it made a big mess. The 2nd time I had refiled the paint jar and laid the nozzle assembly down upside down so it wouldn't drip. That must be a no-no, because when I put it back in service it didn't wok well. Regardless in both cases all I did was clean the nozzle as directed and that resolved any problems I caused. Rated 5 out of 5 by DickH from This product worked like it was advertised I used this sprayer with latex paint right from the paint can without having to do anything with the paint except make sure it was stirred properly. The clean up took longer than actually using the sprayer to paint the stucco on my house. What is the maximum PSI and tip width you can get with this model? I have this one and the paint I am using requires 2000 psi and .015-.019 for the tip. 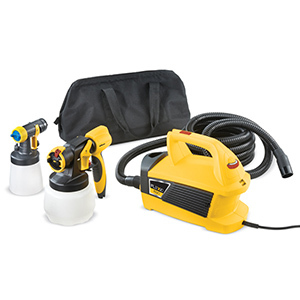 The Flexio 690 is an HVLP (air) sprayer that operates at 3psi and has a 1.8mm tip (Detail Finish) and a 2.5mm tip (iSpray nozzle). The question you are asking is about an airless (contractor model) sprayer. To discuss your options call technical support at 1-800-328-8251. The only difference between the two is in the iSpray front end nozzle. The 4000 iSpray has fewer parts, easier adjustment and a slightly better spray pattern. Otherwise, they are the same. For more help call 800-328-8251. What is the difference between the Flexio 690 and 4000 series sprayers? 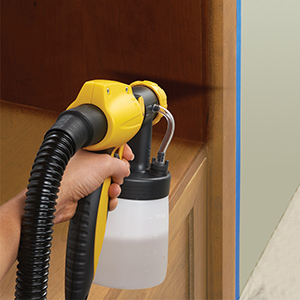 The Flexio 4000 includes our new style I-spray front end nozzle assembly. This allows for a better spray pattern and an easier to use fluid flow control. For further help give us a call at 800-328-8251. Thanks for choosing Wagner! 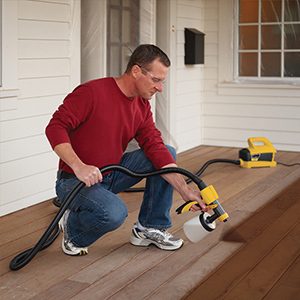 Can you spray a tongue and groove ceiling with the Wagner 690? Sure, you can tilt the sprayer up to 60 degrees towards the ceiling for spraying. Use the detail finish front end and thin latex paint about 10% with water. For more tips call us at 800-328-8251. Yes you can use acrylic paint, anything water or oil based is fine. Any issues with spraying paint/primer in one paints? None. It will require thinning in the detail front end but probably not in the iSpray front end. Good luck with your project. After using the flexico 690 painting my bathroom, I noticed a coat of dust on all my furniture and hardwood floors. What would cause that? Anytime you spray there can be overspray. To reduce overspray make sure you have the flow and speed settings set to the lowest settings than can be as long as you are getting a good pattern. You also want to make sure that the end of the gun is no more than six to eight inches from what you are spraying. Be sure that the room you are in is well ventilated and that the air conditioner is off so that paint does not get in to the ventilation system. If you need further assistance feel free to call us at 1-800-328-8251.